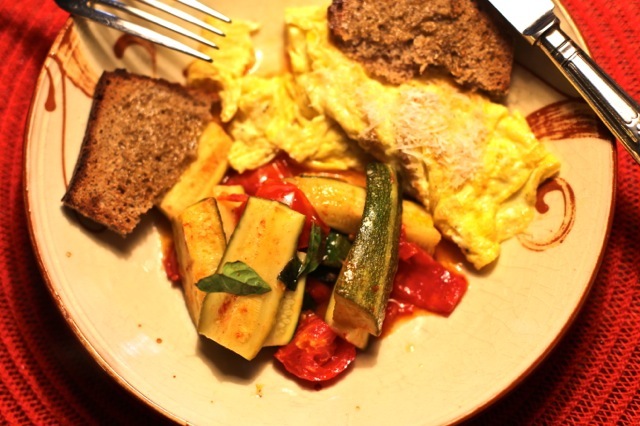 A mid-summer dish this, when zucchini are zingy and the tomatoes ripe and sweet. The squeeze of lemon adds the third dimension. The inspiration for this recipe comes from one of my food heroes, Nigel Slater, in his cookbook, TENDER. The courgettes and tomatoes should retain their brilliant summer colours. Resist overcooking, in other words! 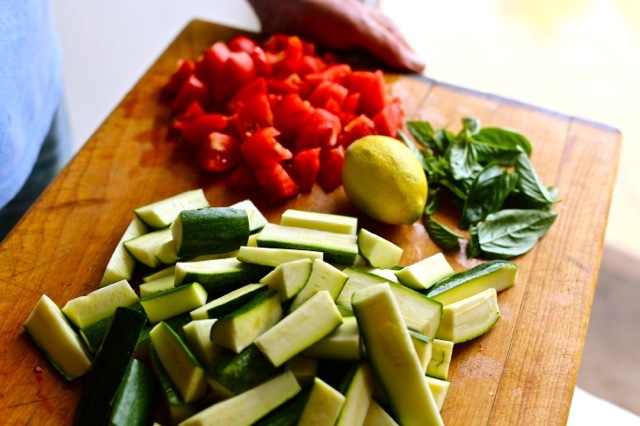 Halve the courgettes length-wise and halve them again–then slice them into not too large chunks [see the photo above]. 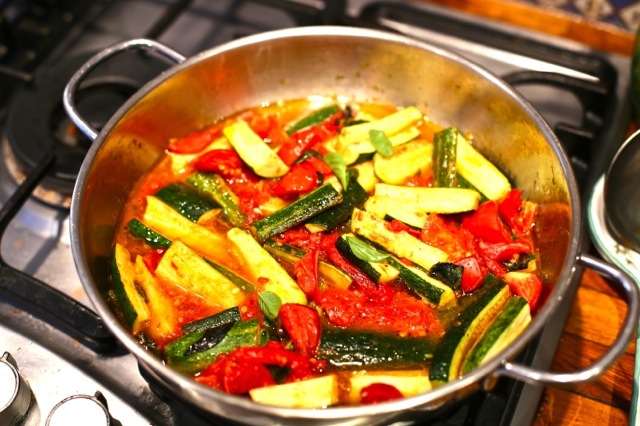 Heat the oil in a largish pan and add the zucchini/courgettes. Cook them gently until they begin to soften–7 to 8 minutes. Add the tomatoes, basil and lemon juice. Cover and cook for about ten minutes to allow everything to get friendly. For lunch it made a pretty picture lying alongside an omelette. This is going to feature often for the rest of the summer! Thank you Robin for another delightful meal. Look forward to trying this one, looks so fresh & the beautiful colours so appetising. I am having a major tummy op on 21st August, so I need to cultivate some good clean recipes, your book is marvellous for this. Where do you get your ideas for all of these delights? Happy summertime to you & Meredith. I trust all will go well on the 21st, Diane. Mmmmm..looks like lunch to me! Robin: Are we onlookers able to post recipes to you and others here? I have a killer recipe for pickled bing cherries and pickled pineapple both to die for…no sterilized jars, steam, etc. These are refrigerator pickles. SO good I eat ’em for breakfast or with curry. There is only a tablespoon of sugar in the bing cherries 2-3 cups of cherries, and none added to the unsweetened pineapple. Saw you flippanting your clerical robes on Poldark Ep. 6. Sunday during the card game. I love that “I think not…” when invited to get another table! LOL Wondering if that is your last appearance? Or are you going to go Bodmin in Launceston when Ross gets in yet more trouble with the next shipwreck? Greetings to all. Feel free, Stevie, and thanks. I made this today and added just a couple of spoonsful of homemade salsa. Delicious. And Robin, I just watched the Wallander episode with you. What a surprise your character was ! Your American accent was very good as well. Thanks Susan–glad you enjoyed both! Zucchini is just fabulous and this looks so tempting. Friends here in NY State with gardens get such an abundance they sometimes toss their leftovers our way,so having another mouthwatering choice for serving it up is most welcome. And yes, to echo other comments, your Reverend at the card table was a gem of stoppered up venom, without at all resorting to the cliches many other actors might have employed to make your point. Bravo! Thank you for that Elaine–much appreciated. “Stoppered up” I like! Your killing me Robin; that looks soooooo delish!! I have not had fresh zucchini for two years since I have not been able to plant my container garden. Next year for sure. Until then I am stuck looking over at my neighbors garden which is beautiful. He has a gift for growing veggies. And to add my two cents, your performance of grand indignation was acted out perfectly. By the way, the Acorn website and channel on Roku has your original performance as Ross Poldark airing. Both seasons in fact. I started a membership to watch “Lovejoy” and discovered “Poldark” was there as well. Such a delight!! Hi Robin, made this yesterday and it was delicious AND make me look like I can cook !!! BONUS. Have you ever used sorrel in any of your recipes? I have heard it mentioned by a couple of chefs on TV recently. It seems to be an ‘old’ herb but may be enjoying a bit of a resurgence. However I read that it is sour so I’m a bit nervous to attempt using it. It’s supposed to have all kinds of benefits but I’ll happily forego benefits for taste anytime. Hello Ros. Sorrel is popular here and available in season in the markets. I have never really got used to the sourness so I don’t go for it. Those that love it don’t understand!You could try it in an omelette–briefly softened in oil/butter beforehand. Thank you. Hmmm might pass on this. I’ll leave sour to Messrs Halse and Warleggan ! !